Montreal’s Expo 67 was the most successful World’s Fair in history, a vision of the future laced with monorails and space-age architecture. Its stunning centerpiece was the Biosphere, a 250-foot tall geodesic dome designed by Buckminster Fuller, which remained on the site after the fair left town. For the 50th anniversary of the Expo, one designer wants a vegetated version of the dome to rise next to the original. The green dome is the idea of Dror Benshetrit, a New York-based designer known for his furniture and product design. 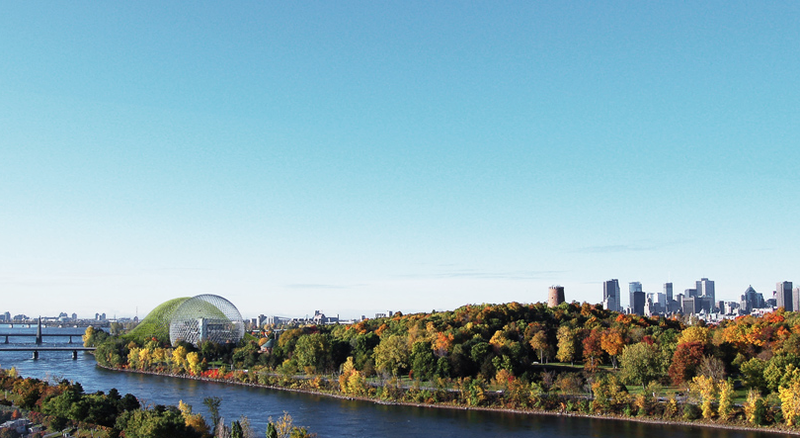 He recently toured the Biosphere and surrounding park with designers from the Buckminister Fuller Institute, with the intention to make the site more of a destination for the city. The Biosphere was originally home to the US Pavilion (also known as the Skybreak Bubble Geodesic Pavilion) but is currently used as a museum. In a statement, Benshetrit said he was drawn to the project because he saw the Biosphere as an “orphan” on the skyline. “Poetically engaging Bucky’s existing structure in a visual dance, interacting much like the sun and the moon, the Biosphere is no longer alone; it has a partner,” he said. Like the original, the new dome would consist of an aluminum frame, but the 2017 version would be draped with a planted canopy that also acts as a sound barrier to protect the performance space within. Would Bucky approve of such a plan? I think so. At the time the Biosphere was designed, his geodesic domes were some of the most radical things ever seen on this Earth—a seemingly impossible structure that took advantage of new materials and innovative engineering. But Fuller was also a champion of sustainable design—an award named after him gives $100,000 to an ecological design solution. A green, living canopy that provides shade, oxygen, and a community gathering place certainly builds upon Fuller’s legacy and propels it into the future.